Claude Monet, Le Palais Contarini. Estimated at £15  20 million / HK$ 176  235 million. Photo: Sotheby's. LONDON.- Coinciding with the public opening of the Venice Biennale, Sothebys announced that on 19th June it will offer an exceptionally rare and important view of Venice by Claude Monet. Estimated at £15  20 million / HK$ 176  235 million, Le Palais Contarini (The Contarini Palace) will be the star lot of the summer sales season in London. Painted by Monet during a three-month trip to the city in 1908  the year of one of the first Venice Biennales  the painting dates from the peak of Monets career. After so much procrastination, Monet soon adopted a rigorous schedule in Venice. Alices description of his work day establishes that from the very inception of his Venetian campaign, Monet organized his time and conceived of the seriality of his work very differently from his previous projects. In Venice, Monet divided his daily schedule into periods of approximately two hours, undertaken at the same time every day and on the same given motif. Unlike his usual methods of charting the changes of time and light as the course of the day would progress, here Monet was interested in painting his different motifs under exactly the same conditions. One could say that he had a fixed appointment with his motifs at the same time each day. The implication of this decision is very simple; for Monet in Venice, time was not to be one of the factors of variations for his motifs. Rather, it was the 'air', or what he called 'the envelope' - the surrounding atmospheric conditions, the famous Venetian haze - that became the principal factor of variation with these motifs (J. Pissarro, Monet and the Mediterranean, New York, 1977, p. 50). The magnificence of nature only reigns supreme in those parts of the landscape from which the bustling city of pleasure can be seen from far enough away that one can believe in the fantasy of the lifeless city lying in the sun (G. Geffroy, Claude Monet, sa vie, son temps, son uvre, Paris, 1924, pp. 318 & 320). Matisse is recorded to have noted: it seemed to me that Turner must have been the link between the academic tradition and impressionism (quoted in Turner, Whistler, Monet (exhibition catalogue), op. cit., p. 203) and divined a special connection between Turners works and Monets. Writing in the catalogue for the Turner, Whistler, Monet exhibition, in which the present work was included, Katherin Lochnan pinpoints the Venice pictures as the culmination of Monets discourse with those two painters: These beautiful and poetic works are portals through which the viewer can enter a world of memories, reveries and dreams. Fearing that they might constitute the final chapter in his artistic evolution, Monet sounded in them the last notes of his artistic dialogue with Turner and Whistler that had been central to his artistic development (K. Lochnan in ibid. p. 35). In Venice Monet continued to observe, as he had in the views of the river Thames he completed in 1904, how light reflected off a wide stretch of water dissolves and liquefies the solid, uneven surfaces of stone walls. In Venice, however, the closeness of the buildings to the water's edge led him to explore more abstract compositions, accentuating the interplay between the rhythms of the ornate façade, with its arched openings and horizontal divisions, and the rhythmic expanse of water. The glorious late canvases that Turner produced in the early 1840s, such as San Benedetto, Looking towards Fusina (fig. 4), presents a Venice which is transfigured by light. 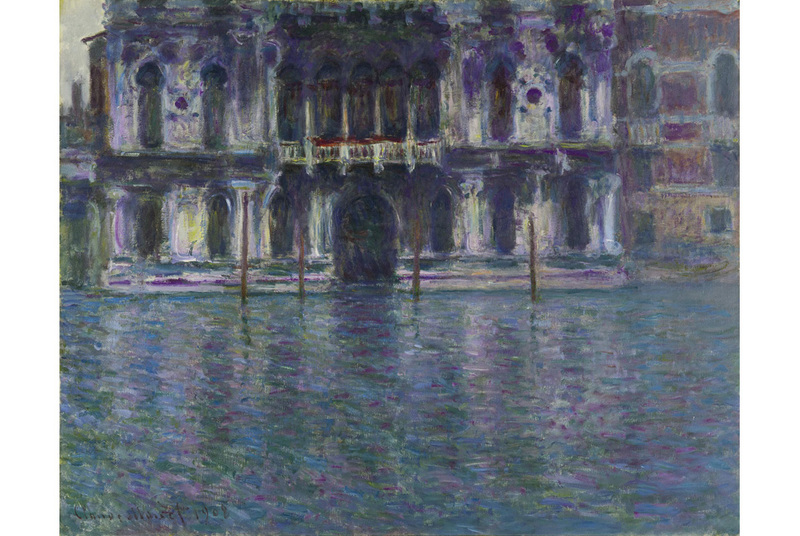 Similarly in Le Palais Contarini, Monet has suffused the very bricks and mortar with amethyst, lilac and cobalt blue. In his introduction to the Bernheim-Jeune exhibition, Octave Mirbeau observed that the atmosphere in Monet's views of Venetian palaces was mixed with colour as though it had passed through a stained-glass window (O. Mirbeau, quoted in ibid., p. 206). The Palazzo Contarini is one of the most important early renaissance buildings in Venice, also known as Contarini dal Zaffo. Located in the Dorsoduro district to the north of the city, its celebrated façade is faced by marble and derives its style from Etruscan sources. Although little is known of the early history of the building, the various names bestowed upon it over the past five hundred years have featured some various patronymics, including that of the Manzoni and Polignac families. At the beginning of the 20th century, it housed the salon of the Princess Winnaretta de Polignac, née Singer, who counted amongst her guests Ethel Smyth and Igor Stravinsky. It was the Princess de Polignac who acquired the two outstanding frescoes by Domenico Tiepolo, executed in 1784, from the Palazzo Correr a Santa Fosca, and installed them in the Palazzo Contarini. During the course of his stay Monet painted thirty-seven canvases of Venetian subjects, which depicted views of the Grand Canal, San Giorgio Maggiore, the Rio della Salute; the Palazzos Daria, Mula, Contarini and the Doges Palace (fig. 3). On 19th December 1908, a few days after Monets return to Paris, Bernheim-Jeune acquired twenty-eight of the thirty-seven views of Venice although Monet kept the pictures in his studio until 1912 to give them their finishing touches. After the death of Alice in 1911, Monet finally agreed on a date for the exhibition at Bernheim-Jeune. Claude Monet Venise opened on 28th May 1912 and was greeted with considerable critical acclaim, not least by Paul Signac who viewed the Venetian canvases as one of Monets greatest achievements. Writing to Monet he states: When I looked at your Venice paintings with their admirable interpretation of the motifs I know so well, I experienced a deep emotion, as strong as the one I felt in 1879 when confronted by your train stations, your streets hung with flags, your trees in bloom, a moment that was decisive for my future career. And these Venetian pictures are stronger still, where everything supports the expression of your vision, where no detail undermines the emotional impact, where you have attained the selflessness advocated by Delacroix. I admire them as the highest manifestations of your art (P. Signac quoted in Turner, Whistler, Monet (exhibition catalogue), op. cit., p. 207). A few years after the exhibition at Bernheim-Jeune Le Palais Contarini was acquired by Adolph Lewisohn (1849-1938), a German-born businessman who had made a fortune in the United States out of copper mining and investment banking. His great wealth enabled him to create an outstanding collection of art which included celebrated paintings by Van Gogh and Gauguin which now hang, respectively in the Metropolitan Museum of Art in New York and the National Gallery of Art in Washington, D.C. Of those pictures that were not bequeathed to his only son Samuel, the remains were given to the Brooklyn Museum of Art. The present painting remained with his family until 1996 when it was acquired by the present owners.